Do you have someone in your life who you suspect has hearing problems? You are not alone. Statistically speaking, it’s possible that most people know at least one individual who is hearing impaired and probably doesn’t realize it. About 36 million people in the United States have hearing challenges, according to Dr. Bettie Borton, AuD, president of the American Academy of Audiology. If it’s not a friend, it might be a spouse, parent or a grandparent. Often hearing loss is a progressive issue for most, so even though you can tell there is a problem, they may not see it. It’s common for a person’s friend or family member to be the one who recognizes the problem in the first place. Maybe, what you should be asking is what you can do about it? It’s your job to help your friend or loved one come to the see what you already know. It’s time for them to schedule a hearing test. It’s a complex topic for most because hearing loss and aging tend to go hand-in-hand. Consider some practical and less offensive ways you can get your close friend to agree to get a professional hearing test. Make it about you, though, and not your friend, if that helps. For example, medical science has found a link between some kinds of hearing loss and conditions like Alzheimer’s disease. In fact, a 2014 report issued by Johns Hopkins Medicine shows there is a certain amount of brain shrinkage in patients that ignore their hearing loss as opposed to managing it with hearing aids and other devices. Talk to your friend about the fear you have that undetected hearing loss can hurt you down the road and why you think it’s time for to think about a hearing test. The truth is that most people benefit from getting the occasional hearing test, so why not schedule one for yourself and challenge your friend to join you. Instead of talking about potential hearing loss, make the test part of a comprehensive wellness strategy, something you can work on together You get your nails done together, maybe, you go to the gym together, you might even head to the dentist together, so why not a hearing test? Maybe, tell your friend you need some help because you’re not sure what to expect from a hearing test. You might even claim to that you’re not sure if you have hearing problems of your own. It can’t hurt you to get tested, especially if it helps out a friend. These are little things that a person might not notice about themselves, but friends pick up on easily. Point out some of the tell-tale signs of hearing loss, such as turning the head to one side to hear or the seemingly automatic “What” all through your discussions. It might be your friend always has a look of extreme concentration or even confusion during a conversation. Take the time to write some specific examples, too. The more details you offer, the more your friend will recognize the symptoms. Even it if it doesn’t sink in the first time around, you planted a seed and now this person will start to notice things on their own. Don’t be confrontational, just caring and concerned. Once, you’ve had the talk, offer to make the appointment for your friend. It will usually start with a trip to the ear doctor. Afterward, you can go along for the test as support. Hearing loss is not an easy thing to accept, but an important challenge to face because there are consequences if you don’t. 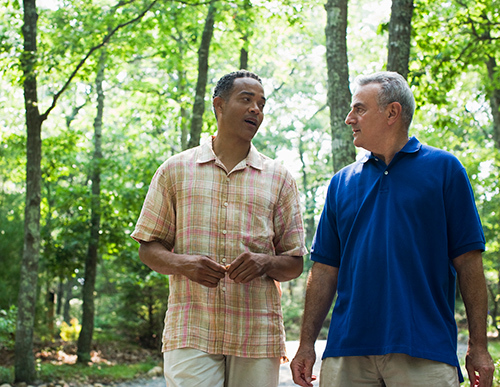 Be that friend that understands the need and help that someone in your life find their way back to healthy hearing.